(3 photos of a 1968 Special Orange Mustang Shelby GT-500KR Fastback) Check out this 1968 Mustang Shelby GT-500KR. It's painted a special order shade of orange. It's pictured here with the owner. KR stands for King of the Road. It has the big 428ci Cobra Jet engine and a manual transmission. (7 photos of a 1968 Raven Black Mustang Shelby GT-350 Fastback) Raven Black 1968 Shelby GT350 fastback with Shelby wheels, front fascia, hood, side scoops, and rear wing. (5 photos of a 1968 Medium Blue Mustang Shelby GT-500KR Convertible) Medium Blue 1968 Shelby GT500 King of the Road Mustang convertible. Shelby named the D color code Acapulco Blue, Medium Blue keeping the D code on the door tag. This car has its original 335hp (at 5200rpm), 428 cubic inch, 4 barrel, Cobra Jet V8 engine all restored. This car has Lucus fog lamps and the correct covers from 1968. 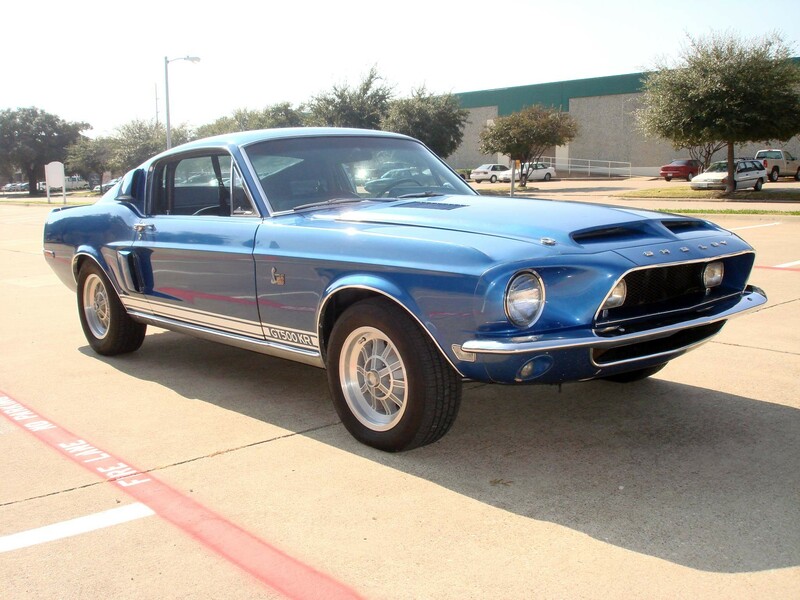 (4 photos of a 1968 Gold Mustang Shelby GT-350 Fastback) Gold 1968 Mustang Shelby GT-350 fastback that was originally ordered by Hertz Rent-a-car. It is one of 223 fastbacks ordered by Hertz in 1968. It has all the Shelby equipment (power disc brakes, power steering, competition handling package, shoulder harnesses, integrated roll bar, deluxe interior, unique console and gages, and tilt / tilt away steering column) plus selected options of an automatic transmission, air conditioning and tinted glass. This car was sold at the Barrett-Jackson auto auction in 2008 Scottsdale Arizona for $92000. (1 photo of a 1968 Medium Blue Mustang Shelby GT-500 Fastback Advertisement) Original advertisement showing a Medium Blue 1968 Shelby GT500 Mustang fastback. The ad says, Carroll Shelby's Cobra GT... for the person who wants everything in one car. (5 photos of a 1968 Gold Mustang Shelby GT-500 Fastback) Gold 1968 Mustang Shelby GT-500 fastback with white rocker stripes. It has the big 428ci engine - characteristic of the GT-500. Those are Shelby custom 15-inch wheels that came with the 1968 Shelby. (4 photos of a 1968 Lime Green Mustang Shelby GT-500 Fastback) This Lime Green 1968 Mustang GT500 fastback was at the 2010 Mustang Club of America Grand Nations in Bellevue, Washington. (5 photos of a 1968 Medium Blue Mustang Shelby GT-500 Fastback) This Medium Blue 1968 Mustang Shelby GT500 fastback was at the 2010 MCA Grand Nationals held in Bellevue, Washington. It doesn't have over the top stripes but it does have one of the 4V V8 engines. (5 photos of a 1968 Dark Green Mustang Shelby GT-500KR Convertible) I just found this photo that I took a year ago of a Dark Green 1968 Mustang Shelby GT500 King of the Road convertible with 10 spoke Shelby wheels, white side stripes, Shelby front fascia with fog lamps, side scoops, rear wing, vented hood, and 428ci super jet V8 engine. This GT500KR is our Attitude Of The Week for the week starting December 11th, 2011.